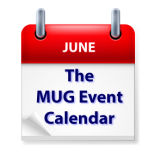 Whether it is listed as an official topic, like groups in California and Ohio have done, or is just part of what is expected, Apple’s WWDC announcements are high on this week’s MUG Event Calendar. Joe Kissell will talk to a California group about them, along with all sorts of other technical wizardry, and tech columnist Rob Pecoraro will address a Virginia group. Email is a hot topic too, with groups in Maine and Florida taking on the topic. Other topics on the agenda for the week include Apple Photos, Twitter, Keyboard Maestro, and Virtual Reality//360° video. Los Angeles Creative Pro Users Group – VR/360° video is here to stay folks so you might as well learn how it works so you can work with it.Join us as we welcome Neil Smith and Matt Celia as they take you behind the scenes of the creation of an incredible virtual journey aboard a Pirate ship sailing the seven seas in search of hidden treasure and deadly contraband. In 360° video. Really. Plus we welcome New Deal Studios Co-Founder,Creative Director and VFX Supervisor Matthew Gratzner. Matt will take us through the process of how he created his Cinematic Narrative VR Films from prep, production and through post. Also digital cinema innovator and rental house Radiant Images will be in the lobby showing off lots of VR gear. North East Ohio Apple Corps – Twitter. Highlights from WWDC.